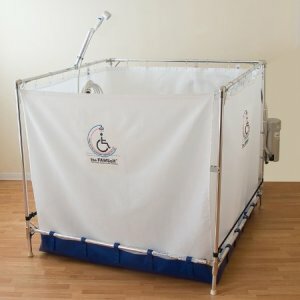 Folding handicapped accessible shower stalls are manufactured for use by individuals with disabilities who find that traditional bathing facilities are difficult or impossible to use, and who may not be able to do re-modeling of the bathroom to allow for full accessibility. Additional MedAme models are designed for emergency services or HazMat. 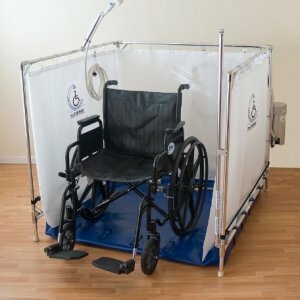 All MedAme models are completely wheelchair accessible and portable, requiring NO tools or modifications to a site for use. 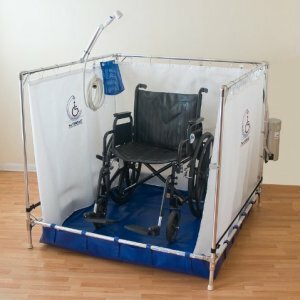 Disabled portable showers are complete handicapped shower stalls. 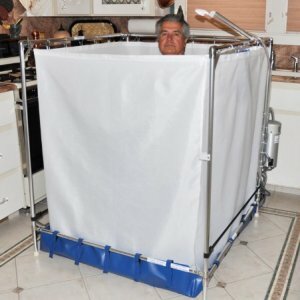 They can be set up anywhere there is access to warm water. Oftentimes, the kitchen is the preferred room to use as there is usually more room to move around the shower than there is in a bathroom. A bedroom or a laundry room, or any room that is within about 10 – 12 feet of a sink can also work. 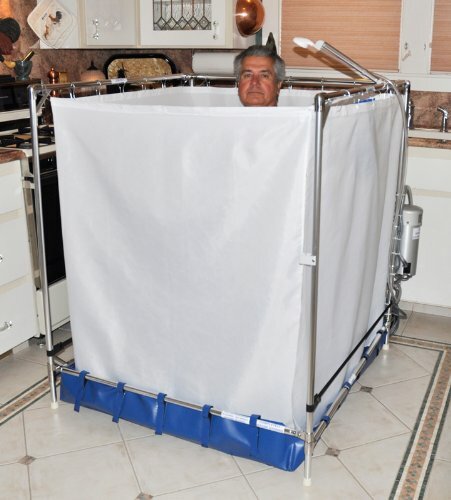 Forget about an expensive bathroom shower remodel, the person to be bathed can be rolled into the shower. 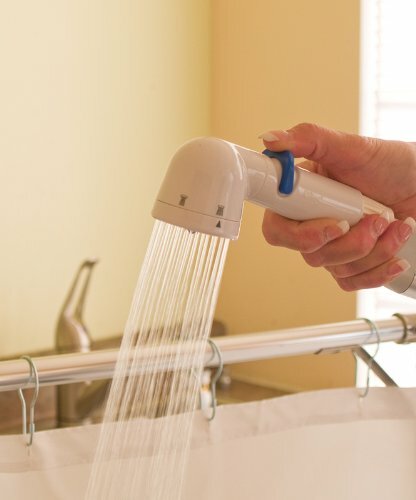 A front shower curtain may be brought around for the person who is able to do their own bathing, or may be left open for easier caregiver access to assist with the bathing. 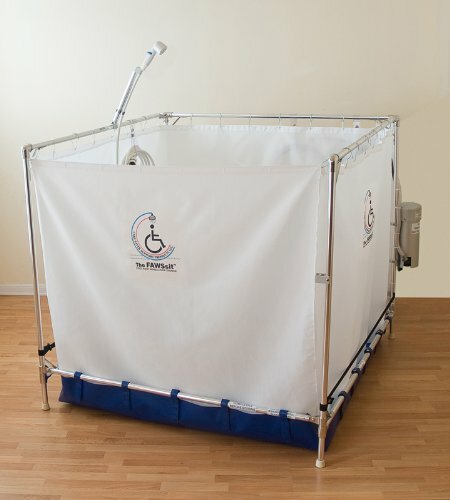 Bariatric wheelchair accessible showers for the disabled 46″L x46″W x44″ H. For use by individuals up to 400 lbs, or who may require a slightly reclined wheelchair whose depth does not exceed 45″ Meets the needs of wheelchair users that require more space for larger size wheelchairs or special patient requirements. 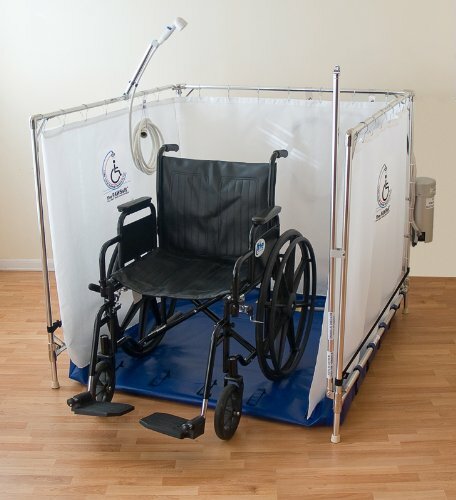 The MedAme-B5000 Bariatric is designed to offer all of the features and benefits of the MedAme-S2000 Standard and the MedAme-SS4040 Super Standard models, but gives added space to accommodate large sized wheelchairs, or even slightly tilted wheelchairs. 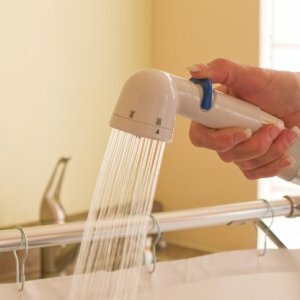 With the MedAme-B5000, even morbidly obese individuals are able to receive a safe, effective shower, and are able to easily reach all body parts with the customized shower head assembly. 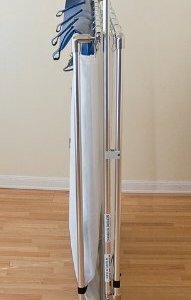 The slightly lower height, at 44″, enables care attendants better access when reaching in to the larger unit to assist with bathing. 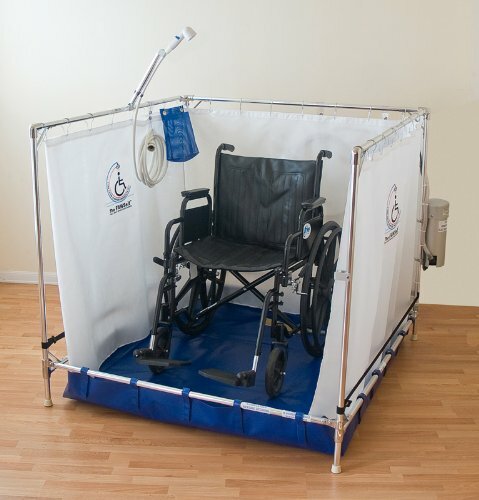 As with all MedAme models, the germicide-imbedded vinyl shower curtains can either be fully enclosed for privacy, or can be left open in front to best enable care attendant access. 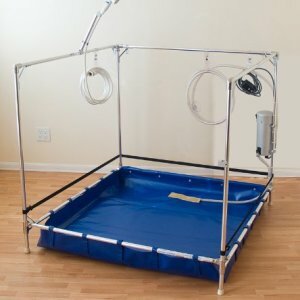 And, only MedAme portable showers have a triple layer, fiberglass-mesh imbedded waste water pan to hold up to multiple years of repeated roll in and roll out without breakdown or tearing. No “foam fatigue” occurs with the MedAme pan design, so water spillage is NOT a problem, as can happen with unsupported foam sided drain pans. 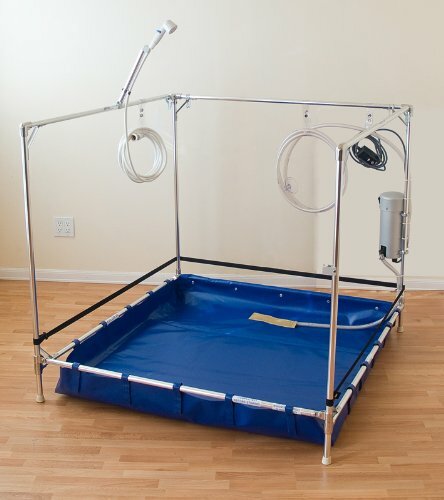 Made in the USA of the highest quality materials. Warranty: 10 years on the frame; One year on all other components. Improved mental and emotional health in knowing that hygiene is more than just adequate. Improved circulation with the stimulation of warm water on extremities. 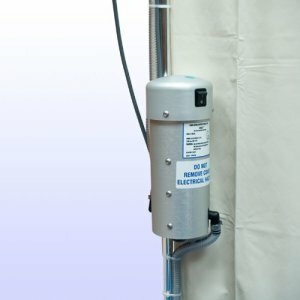 Or, critical body temperature cooling can be easily accomplished. 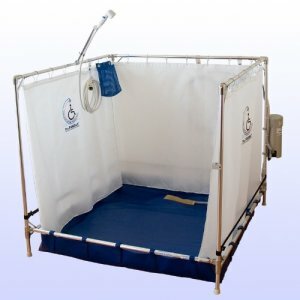 Important for many quadriplegics and others who have diminished abilities to detect body temperature changes.